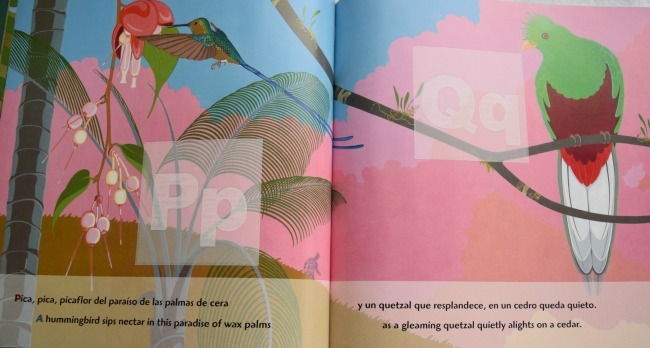 Mommy Maestra: Book Review: Olinguito, from A to Z! Olinguito, from A to Z! ~ ¡Olinguito, de la A a la Z! It's no secret; I love alphabet books. Even though my kids can now read circles around me (not really - but they're lightyears ahead of most kids their age), that doesn't stop me from collecting ABC books. And when it is a bilingual abecedario? Woo! I simply must have it. So when I heard that my friend Lulu was working on an alphabet book, I was (naturally) excited. She is not only a dedicated children's writer, but also one of the most talented artists illustrating children's literature. And her latest book is certainly a visual masterpiece. Olinguito, from A to Z! ~ ¡Olinguito, de la A a la Z! (aff) is a rare glimpse into the heart of a cloud forest. We're there on a mission: to help the zookeeper from Washington, D.C. find the elusive olingo. Along the way we discover beautiful treasures. There is a richness to the illustrations that captures the reader. You can read about the whole process of creating the layered illustrations here on Lee & Low's website and here on the author's website. But it isn't just the artwork that delights me and my family. It is the content. You may remember that my husband and I met when we were both working at a zoo. That was 23 years ago. Since then we have traveled quite a bit to many countries in search of rare animals to photograph, conserve, or research. 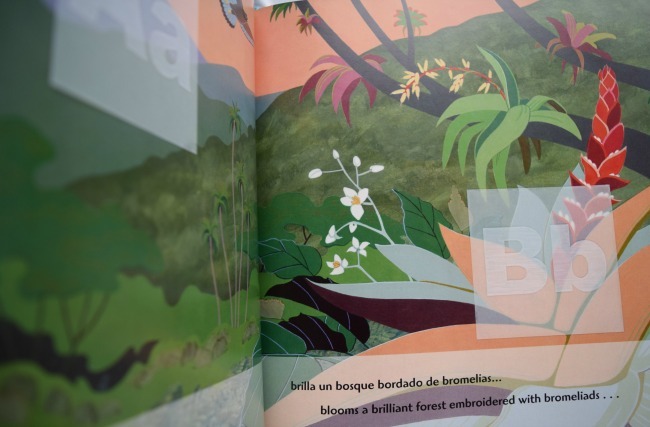 Imagine my delight to discover that each page of this book is filled with flora and fauna that are unique to cloud forests. Lulu's attention to detail makes this book especially remarkable. You'll find plant and animals that few people in this part of the world have seen in the wild, such as orchids and bromeliads and Collared Inca hummingbirds and Spectacled Bears. The best part of the book is the full text in both English and Spanish. And it should be obvious to any bilingual speaker that the book was originally written in Spanish and then translated into English. Not that the latter is poor in any way, but simply because the Spanish is so well done. In my opinion, Olinguito, from A to Z! is a must-have for any home library. Teachers: this book works well with lessons and unit studies of cloud forests, Ecuador, wildlife, conservation, zoology, animals, Earth Day, science, and nature.